Once again, I was thrilled with the IBAH events that we hosted this year! Thank you to our sponsors and unveiling our winners! I would like to start by saying, what a pleasure the last year has been for me. I have enjoyed planning the Christmas Mix and Mingle and the Golf Tournament, however, being part of a board of Directors with such amazing colleagues and friends, makes planning these events so easy to do. Hard work and dedication are put forth by all the members on the board, so that we the board, can enjoy these events with you, our member brokers and associate members, which I think I can speak for everyone, is such a great pleasure. Our annual Christmas Mix and Mingle was held on November 26, 2015. We changed things up slightly by adding a market place, which I feel was enjoyed by all. We had vendors such as Stella and Dot, Steeped Tea, Silpada and much more. Paul’s Restoration donated the poinsettia's once again, which made the room at the Waterfront Centre look beautiful. Thank you, Paul’s!! Door prizes were donated by Aviva, Intact, Fix Auto and First Response, thank you to all. It is donations like these that help make our events successful. As we do every year at this event we held a toy and food drive. Toys went to City kids, along with a cash donation, which was presented to Susan Morris of City Kids that evening. Food donations were delivered to Good Sheppard the following day. Our annual golf tournament, which was held on August 16th, 2016, was a success. We played at Dragon’s Fire Golf Club and despite the inclement weather; the sun eventually came out, making for another fantastic day! Although we did have a few sponsors lose their tents to the wind. “Beat the Pro” was once again hosted by the Golf Club and I am very pleased to advise it was a success, and proceeds were given to City Kidz. Also, a great big thank you to all the companies that donated to our prize table! Your generosity helps in making our tournament a success and is very much appreciated. Team 7A, you know who you are! 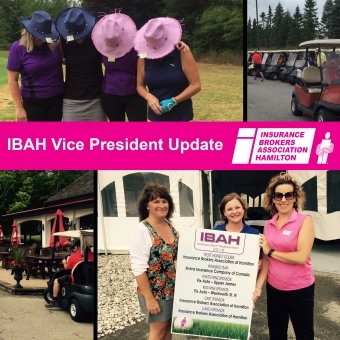 Thank you again to all that participated in the 2016 Annual IBAH Golf Tournament!!! In closing, I would like to thank all our broker members and associate members for your participation and dedication. Events like these are successful because you are a part of them.